Given the daunting, dire predicament in which we find ourselves on this planet, what is described by social critic James Howard Kunstler as a "Long Emergency" may in fact become a "Last Emergency" for humanity. Whether we encounter a "long" or a "last" emergency, Carolyn Baker seeks to offer inspiration and guidance for inhabiting our remaining days with passion, vitality, empathy, intimate contact with our emotions, kindness in our relationships with all species, gratitude, open-hearted receptivity, exquisite creations of beauty, and utilizing every occasion, even our demise, as an opportunity to invoke and "inflict" joy in our world. 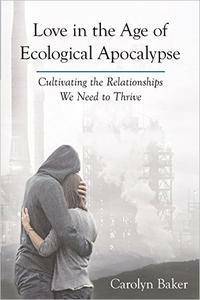 Love in the Age of Ecological Apolcalypse addresses an array of relationships in the Last Emergency and how one's relationship with oneself may enrich or impede interactions with all other beings. Drawing upon her deep experience as a life coach, Baker writes of the specific need to understand our key relationships in a society in collapse, and how to navigate through differing levels of acceptance of collapse, trauma, and grief. Key relationships include those with our partners, children, friends, neighbors, as well as relationships with our work, our bodies, our natural resources, food and eating, animals, future generations, Eros, and indeed, the powers of the universe. Baker's writing is engaging, inspiring, and often beautiful in its depth and candor. She introduces a variety of spiritual practices facilitate our developing a relationship with the deeper Self. With these practices and giving and receiving support from others who are walking a similar path, we begin to live more frequently from the deeper Self, or at least are able to access it more quickly when we find ourselves becoming embroiled in the ego.